Iconic. Scenic. Popular. 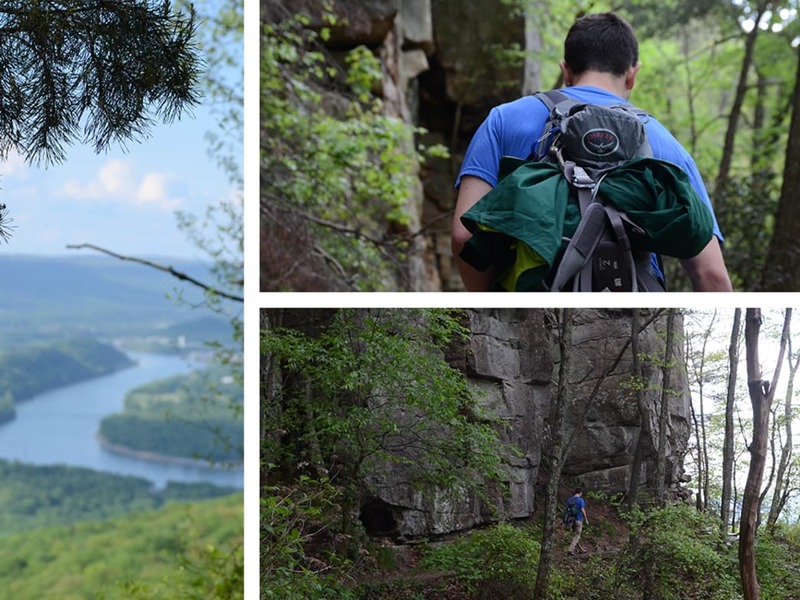 Worthwhile.... Whatever word you want to use, the hike from Lookout Mountain's historic Cravens House to Sunset Rock is always a solid option when seeking a Chattanooga hiking experience. 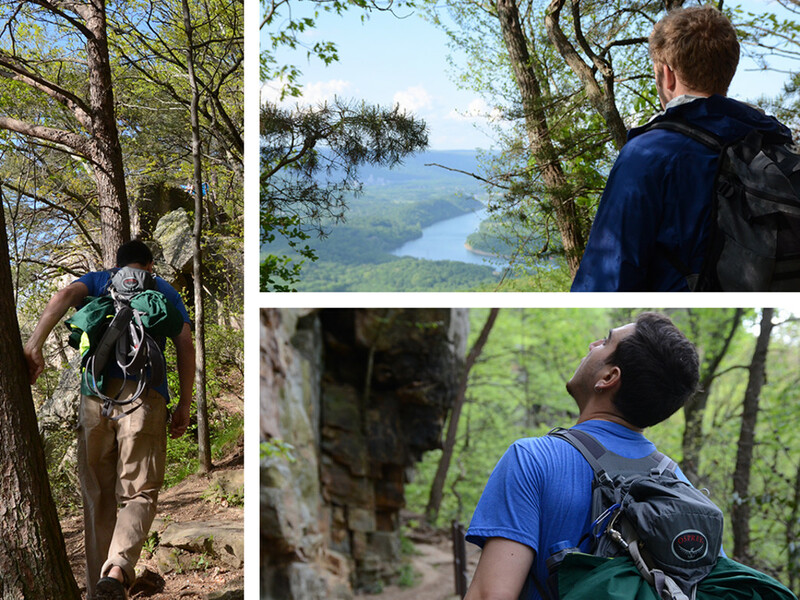 It's one of those hikes that'll never let you down. Close proximity to downtown? Check. Easy parking? Check. A well-maintained trail with mild-to-moderate difficulty? Check. And a killer panorama to top it all off? Absolutely! One of the best things about Cravens House is that it serves as a gateway to a number of Lookout's greatest trails. From it, hikers and trail runners can string together a route that suits whatever mood they're feeling on a given day—whether it's a 4-mile loop with a lung-busting climb up the burly Gum Springs Trail, a less strenuous 4.5-mile loop that works its way up to Point Park before zig-zagging down the front of the mountain, or even a 10-mile loop that links together 7 of Lookout Mountain's trails to create one of the crown jewel trail running experiences in the city. The bottom-line is that you've got options at Cravens House. The most straightforward route you can choose, and the one described in this piece, is the 1.5-mile (3-mile round trip) hike to Sunset Rock and back. About 100 yards into the hike, the trail splits. To the left is a .7 mile hike along the Cravens Trail before it connects with the Bluff Trail. To the right is the Rifle Pits Trail. 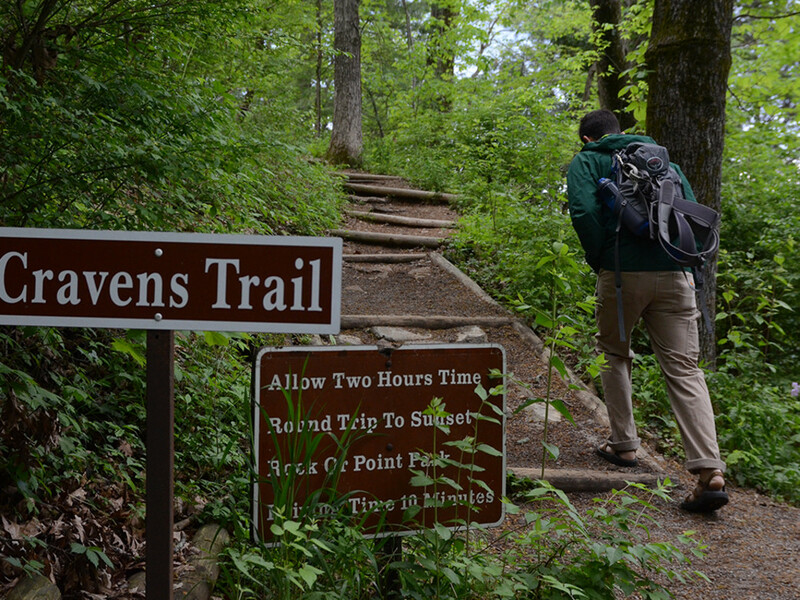 Keep left on the Cravens Trail, and continue your hike to the top of Lookout Mountain. 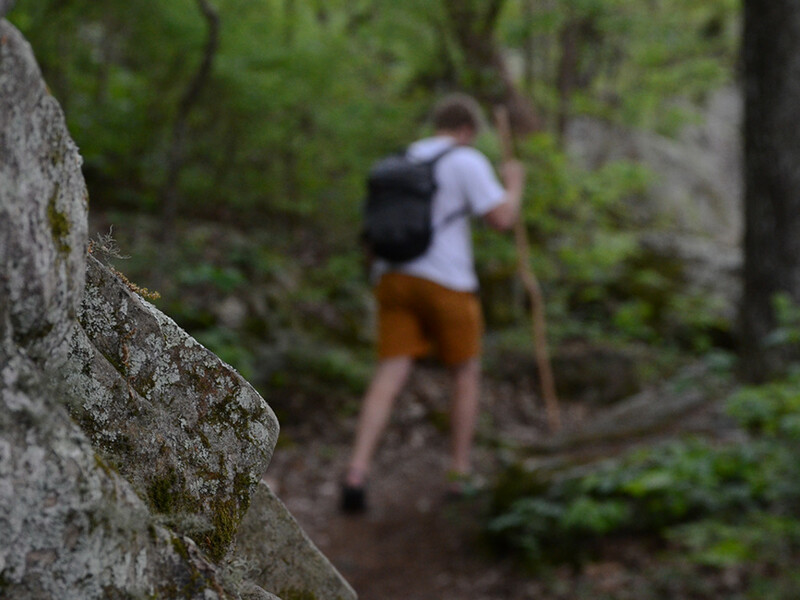 The Cravens Trail is mostly smooth with a few rocky and root-strewn stretches sprinkled along the way. It travels up a gradual uphill, meandering through a mix of hardwood forests, which can be impressively green in the spring and summer and a blur of orange, red, and gold in the autumn. 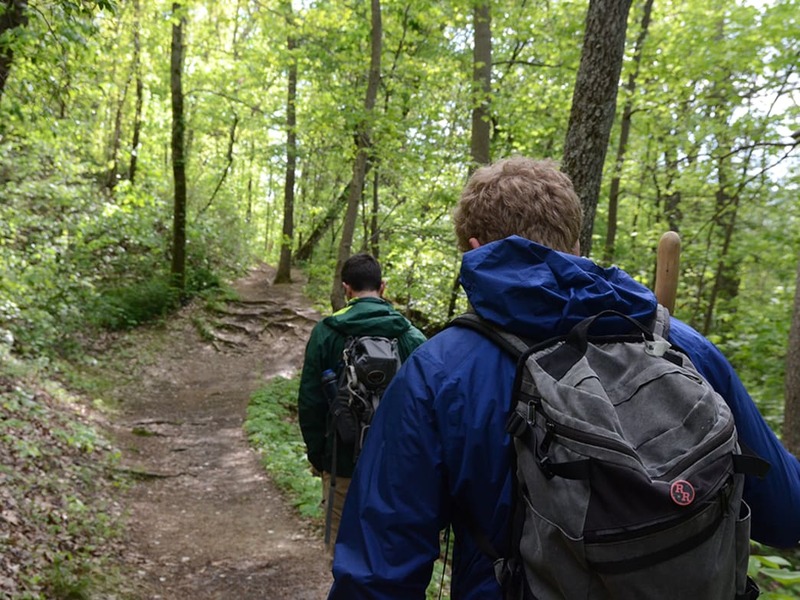 At some point about halfway up, the trail passes under a notably bent and crooked ' trail tree ', and then after 0.7-miles, you'll reach a junction with the Bluff Trail. 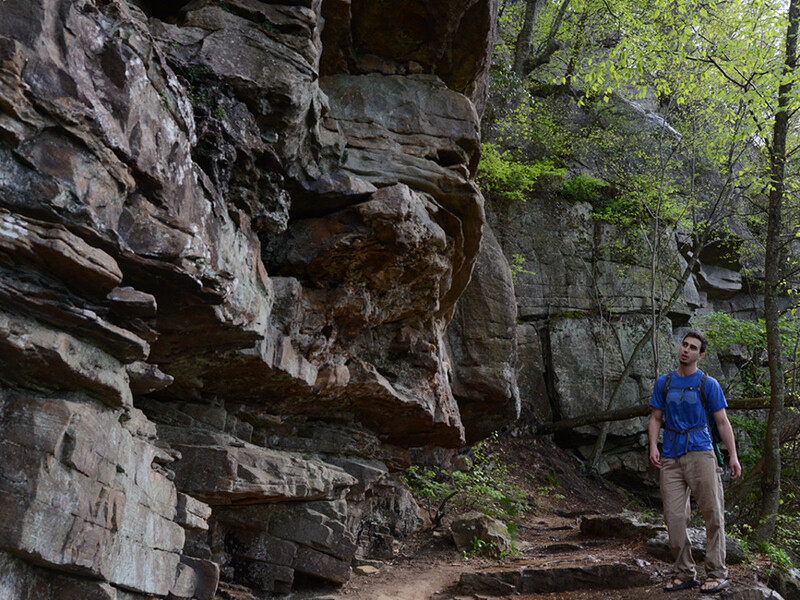 The Bluff Trail is considered by many to be one of the best trails in Chattanooga. For a mile, you'll travel along this trail as it continues to climb up the western flank of Lookout Mountain. It will get rockier and more technical as it climbs. Eventually, you'll reach the section of hard-pack singletrack along the bluff itself. 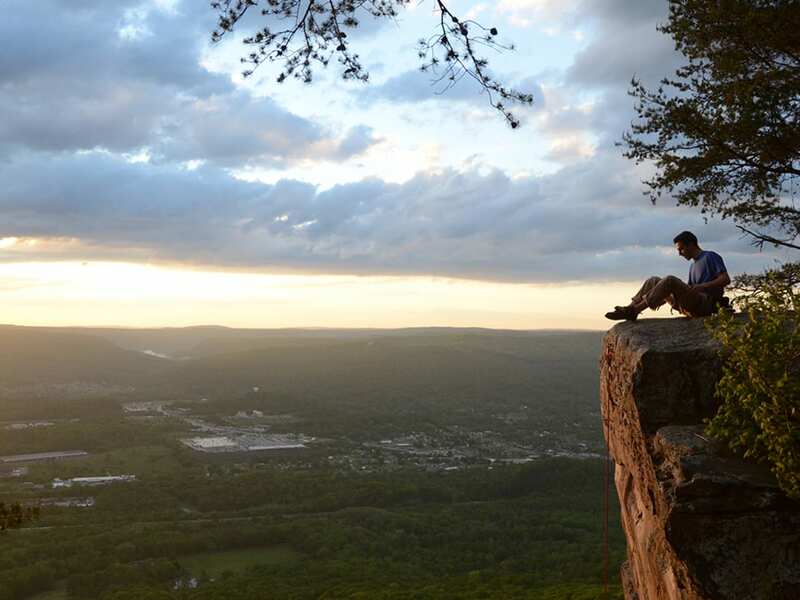 On one side, there will be towering sandstone cliffs, considered by one Chattanooga climber to be as grand as Europe's cathedrals . On the other side, there will be sweeping views of Lookout Valley, Raccoon Mountain, Elder Mountain, and Walden's Ridge peeking out through the trees. You'll also likely encounter a climber or two scaling the sandstone towers to the summit of Sunset Rock. Eventually, you'll reach another junction with a spur trail that branches off to the left and leads up to Sunset Rock. Once you take this left, it's just a short slog up a couple of switchbacks followed by a calf-burning climb up a pretty steep set of rock stairs. Before you know it, you'll reach the top of the bluff and then Sunset Rock itself. The view from Sunset Rock is something seriously special. And it's obvious why it's become such a popular spot in recent years. 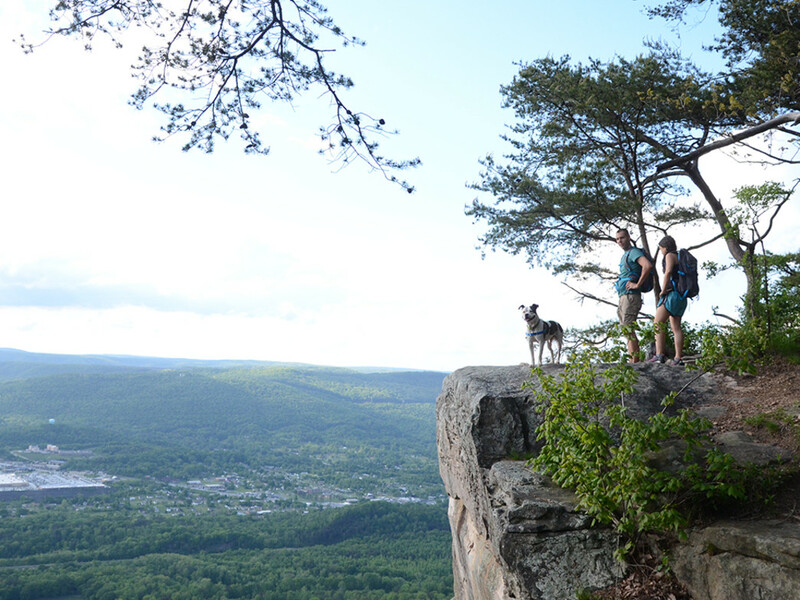 Stretching off to looker's right, Lookout Mountain reaches towards the city of Chattanooga before coming to a point. Below this point, the languid Tennessee River wraps around the fertile floodplain of Moccasin Bend before snaking off towards the Tennessee River Gorge. Directly below, the grassy pastures of Reflection Riding Arboretum and Nature Center can be seen in all their pastoral glory. And even the eyesore of a giant Walmart Supercenter in Tiftonia takes on a more interesting angle from the lofty, quiet heights of Sunset Rock, as you can watch the people down below scurrying around like ants, and you can thank your lucky stars you're not one of them at that moment in time. All in all, this trail's close proximity to downtown, its easy-to-moderate difficulty, and its panoramic payoffs make it a fantastic trail perfectly suited for anything from a quick post-work escape, to a nice family-friendly option, or even an adventuresome date spot. There are group runs posted on Meetup.com under Chattanooga Trail Runners. Planning to do this hike? Share your adventures with us by tagging #RootsRated. And always, when you're out and about in nature, please Leave No Trace. 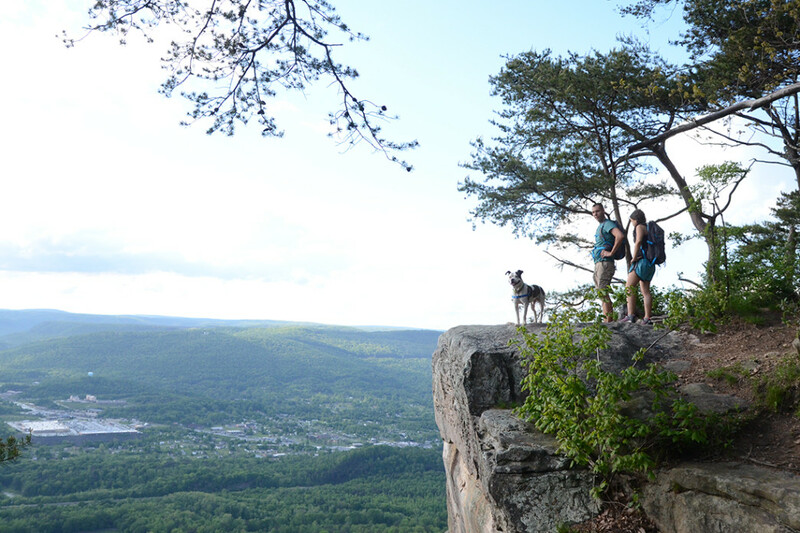 Find the best outdoor equipment and staff in the country at your local Chattanooga outdoor store: Rock/Creek.